BISHOP, CA – Since its founding in 2001, Bishop-based nonprofit Eastern Sierra Land Trust (ESLT) has made its mark in the Eastern Sierra community by maximizing the power of partnerships. Now this collaborative approach is gaining national acclaim. 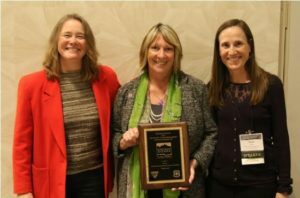 The United States Forest Service (USFS) and Bureau of Land Management (BLM) recently recognized ESLT as the 2018 National Conservation Leadership Partner of the Year. This award carries great distinction in land conservation nationwide. Winners are selected for demonstrating outstanding leadership in collaborative conservation programs that benefit fish, wildlife, and native plants on public lands. Eastern Sierra Land Trust has built a reputation for forging partnerships with diverse stakeholders to advance land conservation efforts in the region. 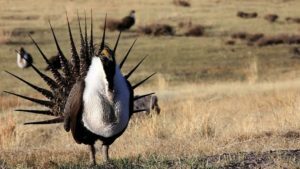 It was chosen for this award based on its innovative, cooperative approach to protecting habitat for wildlife, including the Bi-State distinct population segment of the greater sage-grouse. The Eastern Sierra is home to the Bi-State distinct population of the greater sage-grouse, a sub-population of this rare bird unique to the Nevada-California border. Greater sage-grouse numbers have been in steep decline over the past several decades due to habitat destruction and other threats. The Eastern Sierra is home to a genetically distinct sub-population of this rare bird that is unique to the Nevada-California border. Bi-State sage-grouse are a conservation priority largely thanks to proactive efforts taken by the Bi-State Local Area Working Group (LAWG): a partnership between a diverse group of stakeholders in eastern California and western Nevada, including ESLT. Composed of ranchers, scientists, conservationists, private organizations, state and local officials, and public land managers, the LAWG members work together to develop and implement a plan aimed at preventing fragmentation of sage-grouse habitat in the region. The efforts of ESLT and the LAWG partners are paying off. Thousands of acres of sage-grouse habitat have been permanently safeguarded against the threat of future development. And in 2015, the LAWG’s preemptive efforts played a crucial role in keeping the Bi-State sage-grouse off of the Endangered Species List. ESLT offers assistance to ranchers who wish to ensure that their land remains intact for generations and managed in a way that will provide a sustainable home for wildlife long into the future. These private ranches support the region’s economy and ranching heritage, and they also provide the rare wet meadow habitat that sage-grouse and other wildlife need to thrive. ESLT helps prevent fragmentation of habitat from development and helps preserve the ranching way of life that is emblematic of the wide open spaces of Nevada and California. “The Bi-State LAWG represents a public-private partnership with extraordinary leadership and vision,” Ogden said. “We have embraced the opportunity to work collaboratively with ranchers and partners to prevent the extinction of an at-risk species. Past recipients of the USFS and BLM Conservation Leadership Partner Award include The Nature Conservancy, Mono County, Trout Unlimited, and Rocky Mountain Elk Foundation. Good job ya’ll! Keep up the good work. Congratulations ESLT! Long live the greater sage-grouse.